Innoslate's 'Requirements Document' features automatically-suggested numbering on entity creation, automatically generated hierarchical relationships, hierarchical display with collapsible sections, inline entity editing, sort ascending/descending on any attribute column, customizable attribute columns, gap analysis indicators, and more. Baselining capability is incorporated into 'Requirements Documents,' providing the power to baseline a document, visualize what has changed since the last baseline, and view previous baselined versions of a document. Innoslate enables requirements analysis by enabling a user to obtain a quality score automatically for each requirement at the click of a button. Innoslate will check your requirement against 9 different quality parameters (e.g., Clear and Complete) and determine a quality score accordingly. This provides a quick and efficient way to identify potential issues with your requirements. All requirements can be easily traced directly to functional and physical elements of a model. 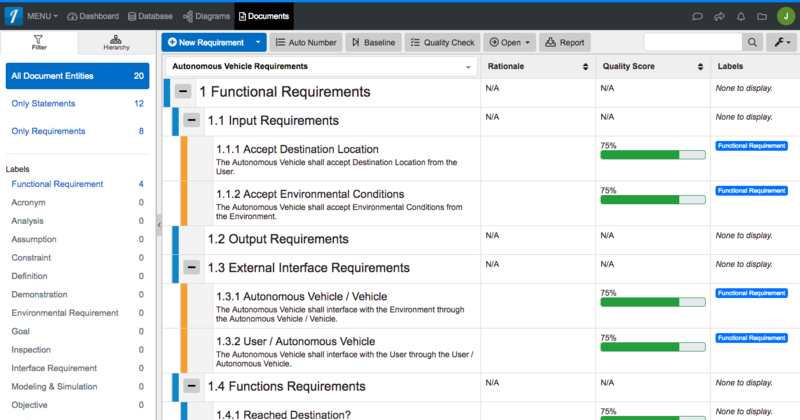 Requirements reports are also available, including reports for verification, validation, and traceability. Innoslate’s ‘Requirements Document’ features automatically-suggested numbering on entity creation, automatically generated hierarchical relationships, hierarchical display with collapsible sections, inline entity editing, sort ascending/descending on any attribute column, customizable attribute columns, gap analysis indicators, and more. Baselining capability is incorporated into ‘Requirements Documents,’ providing the power to baseline a document, visualize what has changed since the last baseline, and view previous baselined versions of a document.